A.V Automobiles Pvt. 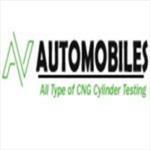 Ltd is a Delhi-based company that is involved in providing CNG Cylinder Hydro Test and CNG Cylinder Testing in Delhi/NCR. The company has its own spacious and well-equipped CNG Sequential Kits Fitment Centre. They render their service to their clients at the rock bottom price, which makes them capable of taking benefit from it.